In strains with lacZ-omega (lacZ N-terminal deletion mutant) like DH5alpha, DH10B and Top10, lacZ-alpha restores the beta-galactosidase activity. 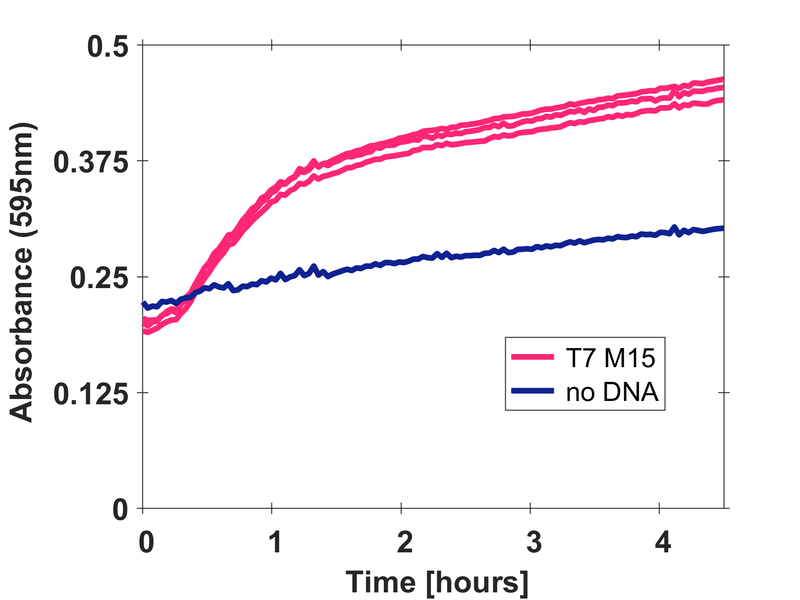 In order to improve the characterization of the lacZalpha fragment, we characterized it in a T7-M15 cell lysate to see whether we obtain high levels of absorbance to use beta-galactosidase and alpha complemetation as our downstream reporter scheme in further experiments. M15 cells have a lacZ delta mutation which makes them encode a form of beta-galactosidase lacking residues 11-41. Beta-galactosidase produced without those residues is missing a small part and is thus not functional. But if this mutated form of beta-galactosidase is brought together with the missing lacZ alpha part (which we express in the lysate in this case), the two will connect and form a functional beta-galactosidase part. In fact beta-galactosidase is a tetramer, it needs for units of LacZalpha and the rest to assemble in order to function. The figure below shows the expression of a functional beta-galactosidase in T7-M15 cells upon the assembly of the differents alpha and omega parts. This part was improved with a T7 promoter and terminator : BBa_K2203002 . This part is also used as a reporter in the following composite parts which are toehold switches : BBa_K2203003 , BBa_K2203004 , BBa_K2203005 , BBa_K2203006 .